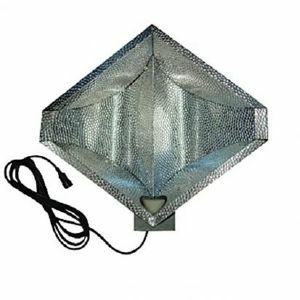 The Diamond reflectors from Ecotechnics are the result of many years of experience in horticultural lighting technology. Designed in a photometric laboratory the spread of light from the lamp is scientifically optimized. You can visibly see the difference between the amount of usable light being reflected by the Diamond and that being put down by inferior reflectors, but the best way to see how good this reflector is to buy one and trial it along side another brand, you'll be pleasantly surprised at the results. The Large reflector is suitable for a 600w ballasts.